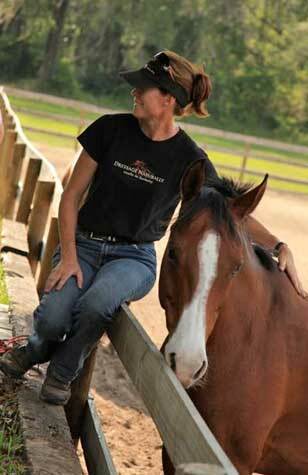 Improve your horse’s movement, find more harmony, and have fun doing it. This experience is for any rider and horse, regardless of discipline. Learn skills to solve the problems that are holding you back. Together, you and your horse will find the place of ease. Are you ready to create that feeling of fun, freedom, power, and connection you imagined when you first fell in love with horses? 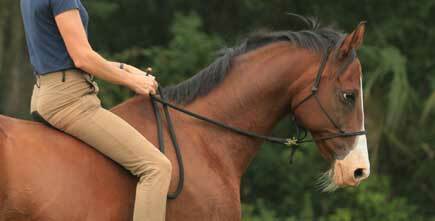 Do you want a horse that is relaxed, energized, balanced, and free? Do you want your horse to enjoy moving in a healthy way? Do you want to have connection without brace? 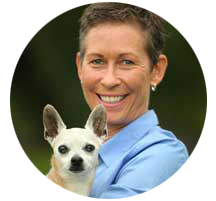 Karen Rohlf, creator of Dressage Naturally, is an internationally recognized clinician who is changing the way students learn dressage. With decades of experience in training horses and riders from zero to Grand Prix, she believes in getting to the heart of our mental, emotional, and physical partnership with our horses by bringing together the best of the worlds of dressage and partnership-based training. 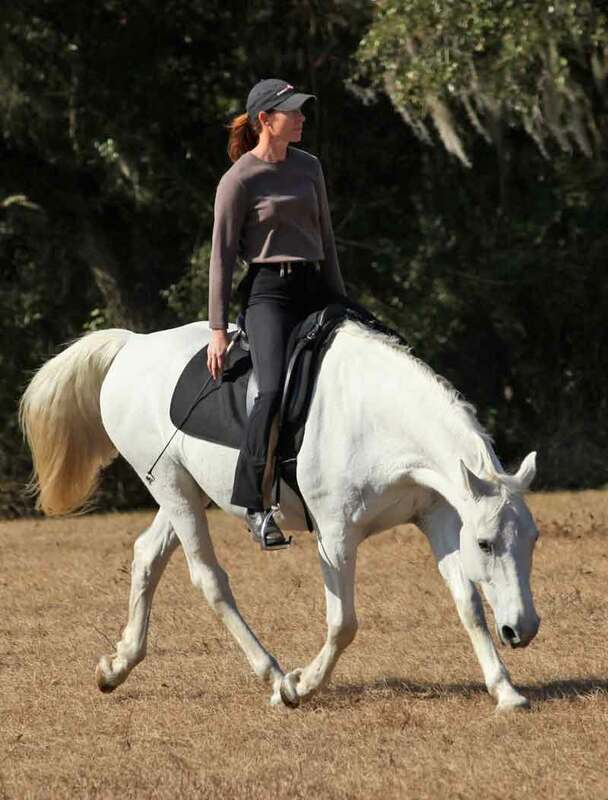 Karen’s in-depth formal dressage training, immersion in a more natural horsemanship, and a belief that anything is possible has given her a unique perspective that breathes new life into common dressage training practices and delivers results for both horses and riders. How to trust your instincts, study independently, and become a more confident learner. Why Take The Sweet Spot Course? We owe it to our horses to build the skills they need to carry us without tension. We need to learn to do it in a way that builds our partnership, feels good (especially to the horse), and empowers us with the confidence & skills to be successful. As a horsemanship enthusiast for well over 20 years, I must admit that [with Karen] I have experienced the best of trainers in my progress to date. This course fills the gap I was experiencing with the western horsemanship training, marrying it well and truly into the bridled dressage training which I was yearning for. .
No matter what stage you are at in your own personal journey, the information in each module is all there to help and guide you through. Even if you feel overwhelmed with the amount of information, there is no pressure. It is your own journey, and there is time to absorb, and go back and forth in the modules at your own pace. There is no judgement or criticism. It is pure learning at your own pace, but with continual support and encouragement. I have gained far more confidence and trust in my own ability. My horse and I are more of a unit and seem to blend together more in a better partnership. I am far more aware of the importance of healthy biomechanics and now have more knowledge on diagnosing and deciding what needs to be worked on to improve. The virtual arena Sweet Spot class was a perfect way for me to learn at my own pace, at the speed we could manage. I was previously going it alone and it was easy to lose motivation. The course kept me on track with goal setting along the way. Daily interaction on Facebook and biweekly calls [in the maximum engagement group] made me part of a group of like minded, horse loving, independent learners... The biggest change was in my way of thinking. Now we (me and my horses) are doing things together versus me doing things to them. It is simply more enjoyable and lots more fun. I loved this course! It provided me an opportunity to progress in my horsemanship along a path that was easy to follow, constantly stimulating, and full of information in a supportive and positive atmosphere. It was fun and very satisfying for both me and my horse! Now I am more empowered to affect the posture and emotional stability of my horse in a positive way. I have knowledge of what my horse needs and of what I can do to provide the opportunity for her to succeed. Big emotional issues like bolting, rearing, and explosiveness are foundational issues which will not be covered in this course and should be resolved with a foundation specialist. Registration for this semester is currently closed. 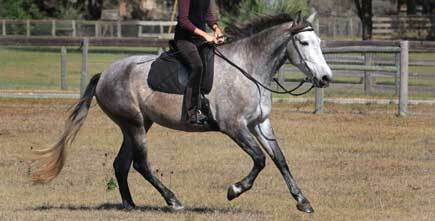 Do I need to take the Habits For Excellent Horsemanship course before the Sweet Spot course? 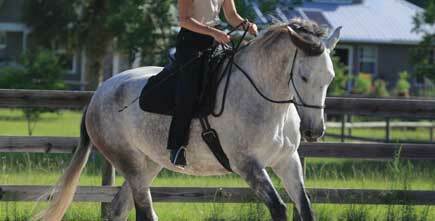 The Habits For Excellent Horsemanship course is recommended but not required. If you feel you already have a good partnership or are familiar with natural horsemanship principles you will feel right at home in the Sweet Spot course. If you are less familiar with techniques to grow your partnership, or want Karen’s unique perspective you may want to get the Horsemanship course. 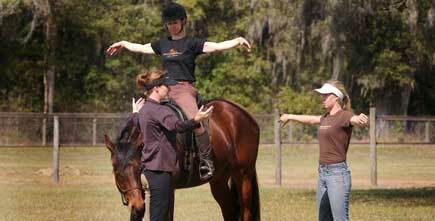 Many students have done the Horsemanship course at the same time as the Sweet Spot course. Everything helps everything! Do I need to have any prior dressage experience? No! We love being a student’s first experience with dressage! We also love dressage students who are looking for a fresh perspective on how to do dressage for the horse in a way that both horse and rider can enjoy it! I am really interested in dressage movements. Will I learn that in this course? 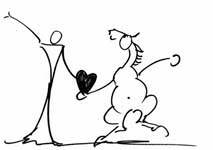 The Sweet Spot course is a necessary prerequisite for doing all dressage movements in harmony. The information in the Sweet Spot course gives you the fundamentals of all the movements and will explain the basic concepts and exercises that will keep the harmony as you move up the gymnastic ladder. What if I already have a local instructor? Many students in the Sweet Spot course are able to continue with their local instructor or trainer. Of course every situation is different. Some instructors embrace the process and are able to help. Some instructors never know the student is taking this course, they just get to be amazed at the sudden progress of their student! Some instructors will be resistant to their students doing any independent learning. We can help students navigate this on an individual basis through the course support systems. This course gave me a healthy way of creating and realizing progress with my horse's biomechanics. I have already recommended this course to students and professionals alike! I am so impressed how it has been organized and developed. Nobody, but nobody, has an independent learning program this good! I would confidently and enthusiastically recommend it!" This is where you will learn how dressage and natural horsemanship combine so you can have the best of both worlds. You also will discover the parts of your foundation that you will especially want to have working well in order to get the most out of the exercises to improve your horse’s posture. The first step in creating the dream is creating the ingredients! You will learn how to get 100% responsiveness to the communications necessary to effect your horse’s posture and find the sweet spot of healthy biomechanics. Problems here are the source of at least 80% of the disharmony I see between riders and horses. Put the ingredients together in a way where you and your horse are sharing the movement. 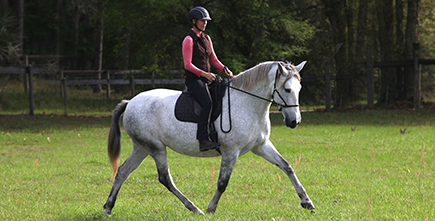 Learn how to cause your horse to participate in sustaining the sweet spot. This is where you will find greater harmony and lightness in self carriage! It’s only fair that we address your human posture too! Learn ways to change and improve your posture in a very unique and lasting way! Develop a more effective position without creating tension! Learn the true purpose of the reins, and how to connect with them. Learn how to preserve self-carriage, and understand when and why to use a bitless bridle or hackamore versus a bit. Learn concepts and exercises to set you and your horse up for true lightness in connection. This is where you solidify your sweet spot of healthy biomechanics and harmonious connection and take it forward with you. Learn concepts and exercises for Flexibility, Mobility, and Collectibility that will allow you to gymnastically develop yourself and your horse. When you join the Virtual Arena course, for the first 6 months you will be a part of our Maximum Engagement Group. You will be able to participate in our weekly live (via web) Q & A calls with Karen or her coaches. Here is where we will celebrate success, share challenges, and get your questions answered! During these Q & A Calls, coaches connect with students, and you’ll have an opportunity to ask questions and listen to the questions from other students. You are welcomed on the Q & A Calls for the full 6 months you are in the Maximum Engagement Group. After the 6 months of Maximum Engagement, you continue to have lifetime access to all the course materials. Adding Q & A Calls to this cutting edge guided virtual learning platform promises to deliver content in a way that is unique and effective in creating lasting change. You can consider me your partner in this course. I’ll be tracking your progress, and will be there to help if you meet challenges. My top priority is that you experience transformation! A schedule with times and dates will be posted online in the Virtual Arena Live Calls area so you can plan ahead to participate. In the event you miss any of the calls, recordings will be available and downloadable so you can listen anywhere and keep them forever! After the first 6 months you will still have lifetime access to all the course materials, and if you want to purchase another 6 months in the Maximum Engagement Group so you can join the live calls again, you can! You will have 5 expert Dressage Naturally Virtual Arena coaches to help you through the course with Q+A calls and private coaching (with or without a video). Among them they speak English, Dutch, Swedish, Polish, and German.